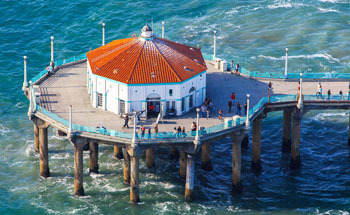 The Manhattan Beach Pier is perhaps the most photographed structures in the city. Hundreds of photos, paintings and even several films feature the concrete pier that juts over 900 feet into the Pacific Ocean -- a soothing place for a stroll and a great place to watch the sun sink into the ocean at the end of a long day. It is very common to see people shooting engagement photos or family photos underneath the pier looking out toward the water. The pier in its current iteration was constructed in 1920. In fact, the California Office of Historical Preservation names it Southern California's oldest remaining example of early reinforced concrete pier construction. It is an extension of Manhattan Beach Boulevard, a lively street full of restaurants and shops that slopes downward from PCH toward the sea. At the very end of the pier is an octagon-shaped building called the Roundhouse, an aquarium with a shark tank and a touch tank. The Roundhouse is free to the public, and hosts regular tours and summertime camps for kids. In 2011, the Leadership Manhattan Beach class chose for their Signs Of The Sea project to install informative plaques all around the structure as well as clean and rehab many part of the roundhouse. The pier is an extremely popular place to visit for both visitors and locals alike, but limited parking ensures that it is never too crowded with people. Fishermen enjoy casting over its railings, and surfers like riding waves between its pilings. 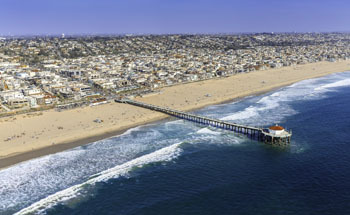 Most of the time, there are people on the pier, walking around, enjoying the calming presence of the ocean and feeling lucky to be in Manhattan Beach. During the Holiday Season, the city of Manhattan Beach really sets the mood by decorating the pier with festive lights that twinkle brightly in the night sky. An Annual Pier Lighting Ceremony is held in downtown Manhattan Beach. This allows the city's local restaurants, retail stores, and businesses to have a Holiday Open House as a way of saying thank you to the community. Stores are usually open later in the evening to accommodate for all the shopping that is to be done. There are a host of family-friendly festivities throughout the night, including live entertainment, carolers, strolling musicians, Santa and his helpers and last but not least the Mayor flips the switch to turn on all the decorative lights strung along the pier. There is even a holiday Fireworks show to set off the night. The Manhattan Beach pier truly makes a statement during the holidays and creates a perfect environment to end the year.